Welcome back! In this inaugural FAUW blog post for the 2013-14 academic year, I would like first to send out a keen welcome to all 70+ new faculty members who have joined UW over the last hiring cycle. FAUW now represents ~1,150 faculty members. I also plan to bring this blog’s readership up to date on the wide assortment of issues both new and ongoing from last year. 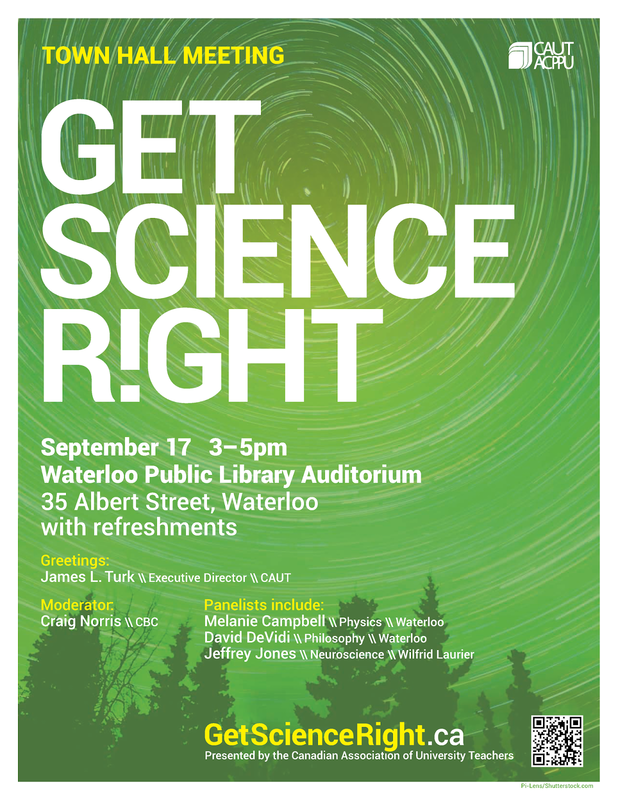 The Canadian Association of University Teachers is holding its inaugural Town Hall meeting that is part of its “Get Science Right” campaign, 17 September 3-5pm at the Waterloo Public Library. This cross-country series of gatherings are intended to alert the Canadian citizenry about the federal government’s attitudes and policies toward a number of imbricated issues: the importance of primary, curiosity-driven research in general; the funding formulae for the Tri-Agencies; the muzzling of government-funded Canadian scientists; and the active discouragement and closure of scientific research when its results prove politically inconvenient. The CBC will be filming an episode of The Fifth Estate at this event, and all faculty members who do research are encouraged in the strongest possible terms to attend. 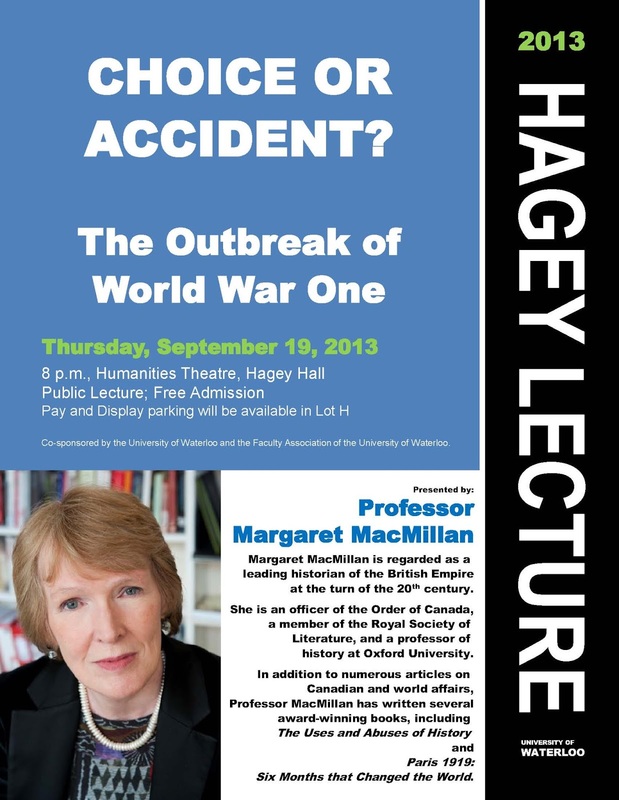 The 2013 Hagey Lecture will be presented by historian Margaret MacMillan on Thursday, 19 September at 8pm in the Humanities Theatre, Hagey Hall. Admission is free. The topic of the lecture will be “Choice or Accident: The Outbreak of World War One”. Margaret MacMillan is regarded as a leading historian of the British Empire at the turn of the 20th century. She is an officer of the Order of Canada, a member of the Royal Society of Literature, and a professor of history at Oxford University. Good news: the construction of the Bright Starts amalgamated daycare building (between the train tracks and the Optometry building on Columbia) is still on schedule, to be ready for occupancy in mid-November. Barring unforeseen impediments, only delays in provincial inspection and licensing will keep this new facility from beginning its operations on schedule in January 2014. Replacing Per Diems: Online Expense Claims? UW is considering the purchase of an automated online expense claims system intended to replace the now-abandoned system of per diem expense claims. This process has raised a number of concerns regarding the security of faculty members’ private financial transactions if a non-Canadian cloud-based provider is selected to supply the software package. Consequently, in collaboration with the Secretariat and the Dean of Mathematics, FAUW is helping to organize a half-day colloquium on electronic security issues so as to inform the university’s decision when it comes to this critical software purchase. Stay tuned to this space for more information about this important event! FAUW will be watching very carefully the progress of the testing being done on the proposed new scheduling system this fall. FAUW is holding firm to its position that the new scheduling system will not be allowed to go live until it is shown to be better than the current system for all constituents (i.e., faculty members, students, administrative staff) and for room allocation. With respect to faculty members, FAUW aims to have each colleague receive two schedules: one hypothetical created using the new system, and the real one arrived at using the current scheme and that is actually the live schedule for the term. FAUW is volunteering to coordinate the compilation of faculty members’ preferences for one schedule or the other. Stay tuned! No Faculty/Staff Change Room in PAC? Over the summer, it has come to FAUW’s attention that the separate, dedicated change room for faculty and staff has been closed without a replacement planned until further notice. Faculty members and staff are now meant to share change rooms and shower space with students. This is an unacceptable situation for a number of very good reasons – the ease of use of camera phones and the potential for sexual harassment lawsuits come to mind. An informal survey conducted by FAUW over the summer showed that the overwhelming majority of faculty members responding (38 of 40) were upset at the change in PAC facilities. This change also affects UW staff, and I am pleased to report that both FAUW and the Staff Association will be encouraging a return to the status quo ante (or some acceptable alternative) in the strongest possible terms. Thanks to FAUW’s suggestion, four spots for covered, secure bike parking have been installed outside of Rod Coutts Hall with a view to assessing how much demand for these there actually is. While this is a commendable start, it is FAUW’s view that such secure facilities fall under the category of “build it, and they will come.” The cost-to-benefit ratio for this initiative should make its spread across campus both inevitable and a no-brainer. Further deployment of these facilities is a priority for FAUW, and we will continue to encourage the university administration to see its merits and virtues for the entire community – students, faculty and staff (e.g., greater fitness and work-life balance; improving security of UW community transportation infrastructure; stemming the flow of incessant reports of bicycle thefts to UW Police; encouraging the reduction in fossil fuel use). The concerns that FAUW had raised in the summer of 2012 about the improper collection and transfer of information between Short-Term and Long-Term disability claims between UW and its insurance provider, Great-West Life, have largely been resolved to FAUW’s satisfaction. Many thanks to all those who contributed to its eventual resolution, both from within FAUW and from UW’s staff in Human Resources. s those contained in the Status of Women and Equity Committee’s Compassionate Care and Bereavement Leave Report. Defining the relationship between FUAC faculty members and their main-campus departmental counterparts. Discussions surrounding the definition of ADDS status are ongoing, and the working group in charge of revisiting this set of regulations aims to report to Faculty Relations Committee and the Graduate Relations Committee this term. This week’s post will accomplish two things: bring you up to date on some of the outstanding issues that have been of concern to our members this year, and also to introduce the members of the Faculty Association board for next year. As a pilot project, UW is looking into and costing out the installation of secure, covered bicycle parking in the vicinity of several buildings on campus. Any suggestions for good examples of existing secure, covered bicycle storage would be greatly appreciated. Dennis Huber informed us that a new user interface would be installed on the FORE accounting system to increase useability and user-friendliness. This process will take some time, however, so we are not to expect improvements before the end of the new academic year. UW administration has accepted FAUW’s suggestion and agreed to set up a task force involving faculty members and graduate students, and chaired by the Associate Provost, Graduate Studies. The purpose of this task force will be to determine what the current ADDS regulations are intended to accomplish, and then to provide recommendations on how to accomplish those things without the drawbacks of the current arrangement. Faculty members hired in the last three years have been informed individually about their ADDS status and supervisory privileges. Sorting out the inconsistencies on the various faculty websites is still an unresolved task. This question of the improper collection and transfer of personal, confidential medical information has been a major concern for FAUW for almost a full year now, yet a resolution is still a work in progress. We can expect an official response to FAUW’s 8-point plan either before the end of this month or, more likely, sometime early in the Fall term. At long last, construction on the amalgamated daycare facility, known as Bright Starts, is well under way, and I understand that it is still on schedule for completion in November this year. I am the fourth Faculty Association president to be involved in shepherding this project through concept to implementation, so the relief at it reaching this advanced stage is spread quite widely. Many thanks are owed to all those who have been involved throughout the process. Future generations of UW faculty, staff and students will carry on being grateful for all the effort deployed. FAUW is working on an implementation matrix for the recommendations of the Work-Life Balance Report. The matrix will include suggestions for allocating responsibility for each of the recommendations, as well as an aspirational timeline for implementing them. We hope to have this matrix submitted to UW administration before the end of this year’s cycle of FAUW Board and FRC meetings (i.e., the end of June). The recommendations of FAUW’s Compassionate Care and Bereavement Leave Report will be considered simultaneously in this exercise.